The following article, by Brother Jerry Cutter, is from the July 1961 Issue of the Old Paths Advocate. It is a great reminder that we should be very careful what we say. 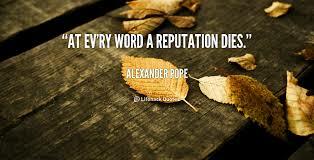 Gossip and slander are a detriment to the church. Unfortunately, reputations have been destroyed by falsehoods that have been spread. Consider carefully the words of this article and be careful what you say. -At every word a reputation dies.” These words were written by the poet Pope concerning eighteenth century English society. Today, sadly we write, the same thing is taking place in the church in many instances. Some people are willing to tell things and others are willing to believe them, whether they are true or not, and that to the detriment of the church. First, we would like to consider three words that Paul used in Romans one. 1. Malignity: A baseness of nature by which we take things by the wrong handle, and expound things always in the worst sense. It is the malignant interpretation of the actions of others, an attributing them all to the worst motive. Did YOU ever do that? 2. Whisperers: These are cowardly sneaks who have not the courage to come out in the open and say damaging things of others, but secretly peddle their slanderous insinuations against the person of their spite. They are “snakes in the grass.” “An ungodly man diggeth up evil: and in his lips there is a burning fire. A froward man soweth strife: and a whisperer separateth chief friends.” Pro. 16:27, 28. In contrast, “He that covereth a transgression seeketh love; but he that repeateth a matter separateth very friends.” Did YOU ever do that? 3. Backbiters: Slanderers, defamers who delight in destroying the good name of others. Whisperers and backbiters are of the same breed, excepting backbiters are more bold. Neither has the courage to face the accused with their slanders, and worse than that, both have left their slimy trails in the church. Were YOU ever guilty of this? Do you know what Paul mentions next in his list of sins? “Haters of God.” To be guilty of any of the above sins is to be a hater of God. Why? James gives the answer. “Therewith bless we God, even the Father; and therewith curse we men, WHICH ARE MADE AFTER THE SIMILITUDE OF GOD. Out of the same mouth proceedeth blessing and cursing. My Brethren, THESE THINGS OUGHT NOT SO TO BE.” In fact, this cannot be. “SO CAN NO FOUNTAIN YIELD SALT WATER AND FRESH.” So we hate God when we speak evilly of man that was made after the similitude of God. How much worse when we speak evilly of ’OUR own brethren? Without any injustice to the scriptures it can be said that our words are pictures of the soul. They show the inner man like a magnifying glass. “Every prudent man dealeth with knowledge: but a fool layeth open his folly,” Pr. 17:8. But now notice, “Even a fool, when he holdeth his peace, is counted wise: and he that shutteth his lips is esteemed a man of understanding,” Pro. 17:28. So our words are magnifying glasses of the soul. Again, our words are seeds and “what a man sows, that shall he also reap.” ‘Who is a wise man and endued, with knowledge among you? . . . For where envying and strife, is, there is confusion and every evil work. But the wisdom that is from above is first pure, then peaceable, gentle, and easy to be intreated, full of mercy and good fruits, without partiality, and without hypocrisy. And the fruit of righteousness is SOWN IN PEACE of them that make peace,” Jas. 3:13-18. So by our words we can sow, we can sow Heaven or Hell, and we shall reap what we sow. Offenses will come, so may the wise reader read carefully the concluding remarks. “A brother offended is harder to be won than a strong city,” Pro.. 18:19. But if through some weakness you do offend, hasten to take this advice, “DO this now, my son, and deliver thyself, when thou art come into the hand of thy friend; go humble thyself, and make sure thy friend. Give not sleep to thine eyes, nor slumber to thine eyelids. Deliver thyself as a roe from the hand of the hunter, and as a bird from the hand of the fowler,” Pro. 6:3-5. Last, Jesus said, “We shall give an account of every idle word that we shall speak.” James said, “Let every man be swift to hear, slow to speak, slow to wrath.” Paul said, “And that ye study to be quiet, and do your own business,” 1 Thess. 4:11. Remember, when sick, to take medicine carefully is to LIVE.